MAJOR ISSUES AND OBJECTIVES: Venice’s trade rivals, especially arch enemy Genoa, wished to temper the city’s aggression and diminish its influence while aggrandizing their own. OUTCOME: Venice endured as a great maritime trading power. Venice and Genoa were ruthless and determined rivals in trade, having fought the VENETIAN-GENOESE WAR (1350–1355) over trade issues and now renewing the conflict in the War of Chioggia. The Genoese mustered a formidable roster of allies. The king of Hungary, who had already won control of Dalmatia from Venice, agreed to shelter and support the Genoese fleet. In 1379 Hungarian troops also presented a threat to Venice by land from the north. Padua was another ally. Its army severed Venice’s communications to the west. 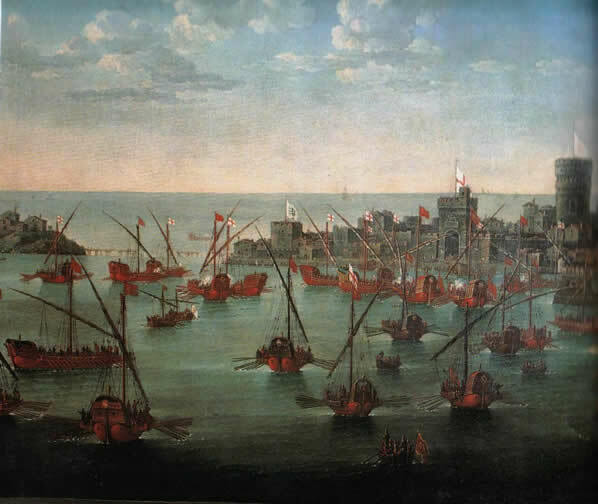 Beset by Hungary and Padua in addition to Genoa, the ever-aggressive Venetians had made the mistake of sending one of their large fleets to raid and prey upon Genoese shipping and ports in the eastern Mediterranean. This left Venice with a significantly weakened fleet for home defense—a fact that did not go unnoticed. In the summer of 1379, the Genoese fleet made a surprise appearance and moved quickly to blockade the entrances to the Venetian lagoon. By mid- August the Genoese forces had been joined by those of Hungary and Padua, so that Venice was encircled. Now the Genoese fleet attacked swiftly at the south end of the lagoon, bringing its fleet into the channels of the lagoon, then with its allies attacking Chioggia, which soon fell. From here the capture and destruction of Venice seemed an inevitable next step. 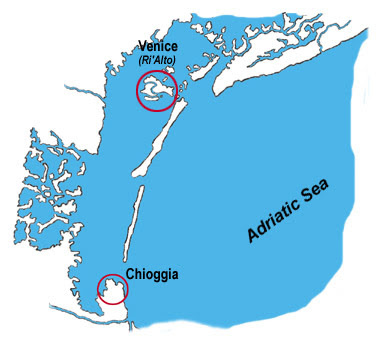 However, on December 22, 1379, the Venetians launched a diversionary attack on Chioggia, then, while the Genoese were occupied in resisting this apparent attempt to retake the settlement, they used the cover of darkness to submerge obstructions, closing off every channel the Genoese fleet could use to escape from the cul-de-sac at Chioggia. When the Venetian galley fleet, which had been on the raiding expedition in the Mediterranean, returned to Venice on January 1, 1380, it was an easy matter to encircle the trapped Genoese. Over the next several months the two sides skirmished as the Genoese attempted to clear a channel of escape. The Venetians impeded this activity by continually firing on the Genoese. Finally, in June 1380 the entire Genoese fleet, effectively held under siege and now on the verge of starvation, surrendered, and 4,000 Genoese sailors were taken prisoner. The spectacular turn-about Venetian victory at Chioggia prompted the signing of the Peace of Turin in 1381. The treaty gained no territory from Genoa or any of its allies, but it did put an end to Genoa’s challenge against Venetian maritime superiority. If Venice did not ultimately triumph over Genoa, it at least earned the right to survive and to continue as a great Mediterranean trading power. Further reading: John Jeffries Martin and Dennis Romano, eds., Venice Reconsidered: The History and Civilization of an Italian City-State, 1297–1797 (Baltimore: Johns Hopkins University Press, 2003); John Julius Norwich, A History of Venice (New York: Knopf, 1989).